The task of predicting fantasy football kickers’ performance has, on multiple occasions and by multiple analysts, been deemed a fool’s errand. Some kickers will do well and others will do poorly—anything more than this fact is beyond us mere mortals. But perhaps we can ask a different question: Given information about each NFL offense, which team’s kicker would be most desirable? A common line of reasoning goes as follows: very bad offenses won’t get into field goal range, so we wouldn’t want a kicker from a team with poor offensive performance. Very good offenses, on the other hand, score so many touchdowns that field goal opportunities will be limited. The conclusion is that there must be a Goldilocks offense, not too bad and not too good, which sets up kickers with field goals (and fantasy owners with points). To test this claim, I’ve pulled Pro-Football-Reference’s data on team offense and kicking from the period 2002-2013. It’s important to note that this is team kicking data. For the 2008 New Orleans Saints, for instance, it doesn’t matter whether Garrett Hartley or Martin Gramatica did the job; the relevant numbers here represent all kicking that was done in a Saints uniform during the 2008 season. 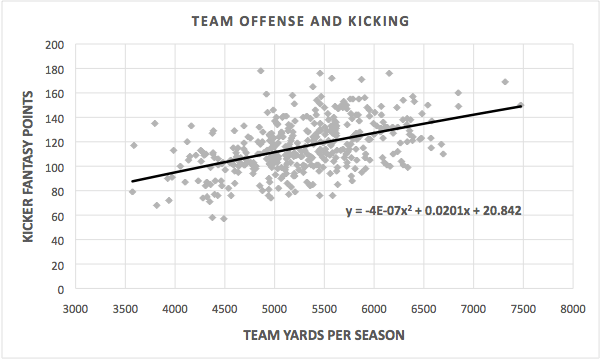 If the relationship between offense and kicking is such that an optimal point exists, it should be reflected through quadratic regression. In theory, the line of best fit would curve up and the peak of the curve would represent the offense that leads to the highest kicker output. I chose yards to represent offensive ability; points would include defensive and special teams scores, which we do not want to measure here. When we run the quadratic regression, however, it becomes clear that the relationship isn’t so curvy. The graph is almost a perfectly straight line, and the coefficient on the quadratic term is five orders of magnitude below that of the linear term. This result implies the link between offensive yardage and kicker performance is quite direct: the better the offense, the more fantasy points we can expect its kicker to score. In one sense, this is disheartening in that it shoots down one of the few theories about forecasting kicker performance. But the upside is that, if you feel comfortable predicting which offenses will be good, you should feel reasonably comfortable selecting a kicker for your fantasy league. This is an old post, but I think a point needs to be considered. Couldn’t you do a similar consideration of yards gained vs touchdowns scored? Then you could pick the optimal point with the most yards gained and lowest touchdowns. This would maybe tell you the team that got the ball down the field the farthest but didn’t score a touchdown. Indicating which team had the most incentives to go for a field goal.